Greetings, readers. Over the last few days there has been a large spike in the numbers of reads of an entry I did after the death of a dear friend, Terry Stewart, posted on July 29, 2016. Both Rebecca and I agree that this may be because my good friend Terry loved the holidays. With Thanksgiving and Christmas coming up – and Terry was a huge Christmas fan – it makes sense that there would be people wanting to revisit Terry again this time of year. So, we have decided to re-post this wonderful and touching tribute to Terry Stewart. Every time my neighbor across the hall opens his door when I am in the hallway, somehow I still expect to see Terry. We were very good friends, and I miss him dearly. This blog entry will be posted automatically at 2:00pm tomorrow, and when I get back from Thanksgiving dinner, I will post it to Facebook. I hope everyone has a wonderful and safe Thanksgiving. Please, if you are traveling, drive safely. Greetings, readers. It is with a heavy heart that I must let you know of the passing of my neighbor across the hall. 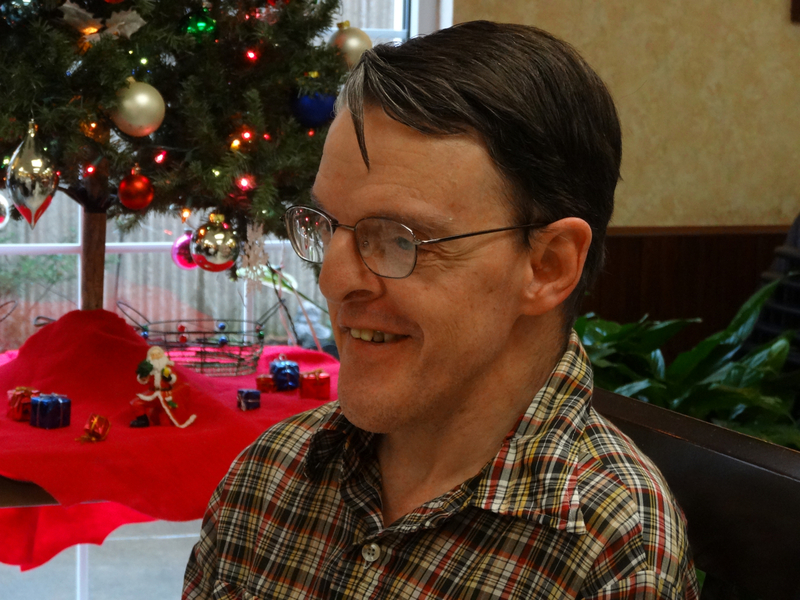 Terry Stuart was a kind and gentle soul, always with a smile. He loved to play the piano, he laughed at my jokes, and enjoyed old movies. I knew Terry for several years. Quite often he would come over and ask for help about a computer problem and I would be more than glad to lend a hand and solve it if I could. The last issue he had was with his printer; the problem was it kept printing the same page over and over. I never could figure that one out. That is where it gets funny. You always think you have more time to help people. But as Rebecca would say, Terry’s contract ran out. I know all of our existences are finite, but somehow we always think we have more time to get things done. We really don’t know. Only the Lord does. I shall miss my good friend Terry very much. 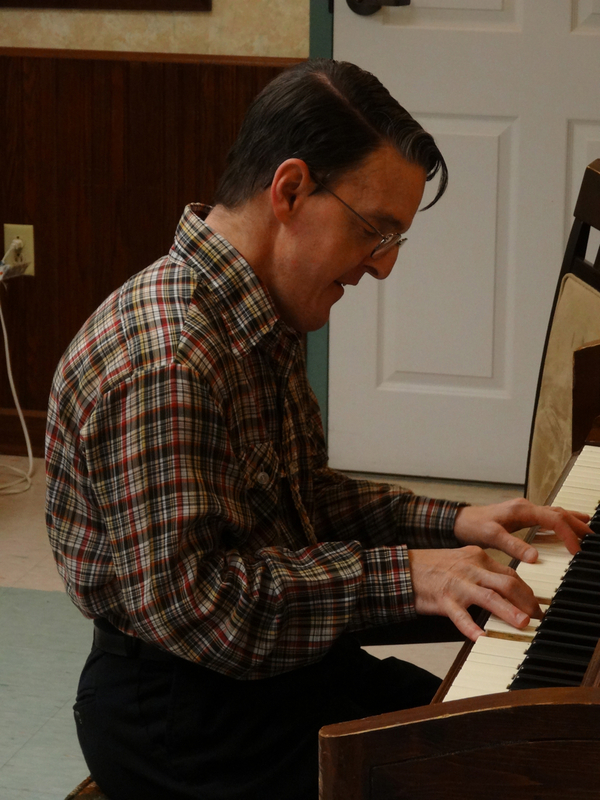 During coffee hours he would often play the piano in the community room. I thought about asking our office manager to tape up a photograph of Terry, which I would give her, on the piano and she agreed. 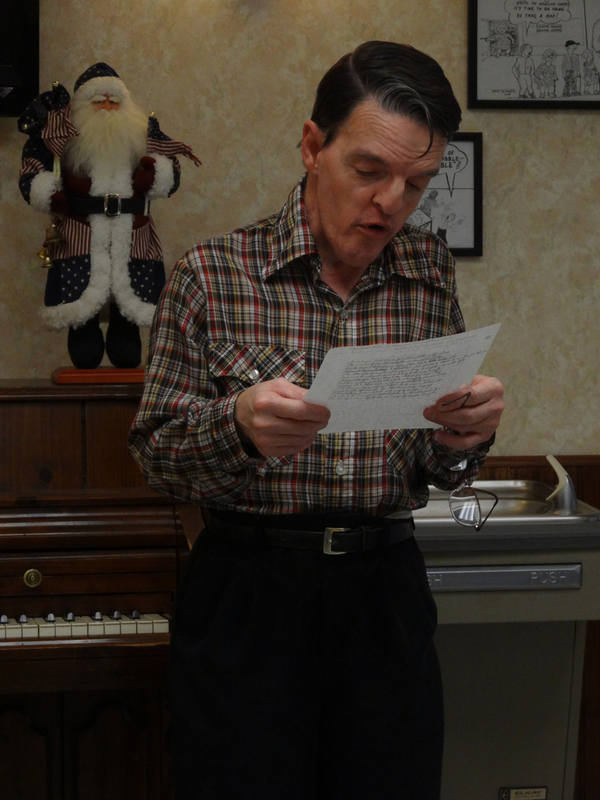 Terry played the piano, sang, and read his own poetry at my performances. He performed during one of my Beatles shows, as one of the three Bedbugs who backed me up, on December 14, 2012. He played the piano and read a poem at my KISS show on December 20, 2013. Rebecca wrote about the Beatles show and the KISS show in these entries. I have a couple of pictures from his performances that I can share at the bottom. It is a good thing that I had therapy yesterday. Among other topics I talked about, I talked about Terry quite a bit. I don’t like death, it scares me. Even though I believe in heaven and the afterlife, I still don’t feel like dying just yet. I guess I’ll never really know what happened to Terry, my good friend, but this building, Addison Court, will be a lonelier place without him. Terry, I bid you a wonderful eternal rest. You were a good friend and I wish I had taken you to Maine two years ago. You would have loved it and the people would have loved you. Rest in peace, my friend. Until next week, have a good weekend, give your loved ones a hug and enjoy them, and happy reading. Terry Stuart playing piano and singing Christmas carols at my show of KISS songs December 20, 2013. Photo by Greg Brown. Terry Stuart reading a Christmas poem which he wrote, The Christmas Star, at my KISS show, December 20, 2013. Photo by Greg Brown. Terry Stuart at my show of KISS songs December 20, 2013. Photo by Greg Brown. Greetings, readers. In just a few hours one of my favorite days will begin. I love Thanksgiving because it has a number of traditions I took part in as a kid and I continue to do to this day. Tomorrow is Thanksgiving day. I’ll get up fairly early, have my morning coffee and take my meds, and get ready to watch the Macy’s Thanksgiving Day parade. Then, a relatively new tradition, if I’m at home, I’m invited out to dinner with Traci and her family. Some years I’m invited to my best friend, David’s, house to take part in their celebration. That is always enjoyable, because I either go by Zipcar or Megabus and make a weekend of it. After I get back from Thanksgiving dinner tomorrow, I will watch what is left of any football games, and take a nap. After I wake up, I will turn on Spotify music and play my hand-selected Christmas Trax. I’d have to say of all the songs I have on that playlist, Earth Kitt’s Santa Baby is my favorite. I performed that at my last show; it was a hit. Please, if you have Spotify, find me, follow me, and subscribe to that playlist, or any playlists of mine you wish. To me, the Christmas season, even though it might start earlier or later for other people, was always from Thanksgiving morning until the day after New Year’s. At home as a child, I would watch my parents put up the tree, most years a live tree, decorate it and plug the lights in; it was so much fun to watch it come alive, as I used to say. There are holiday parades and bowl games during this part of the year, the town is decorated with pretty lights and lit wreaths and a big Christmas tree, and yes, even those first snow storms are pretty. Once the car tires get into it and turn the snow black, well you can have it. Black snow might be the ugliest sight in the world. I always get a tiny bit depressed on January 2nd. Some people in my building will already be taking down their holiday decorations and the season will be over. What’s left is three months of trees with no leaves, grass that does not look green, snow, cold, and wind. Oh joy, oh bliss. And yes, readers, I am being sarcastic. With tomorrow being Thanksgiving, I will let you know what I am thankful for. I am thankful to have a roof over my head and that it is downtown close to many places I need to go, such as shopping and bus stops. I’m also thankful for my many friends and people I call family. I am especially thankful for Rebecca who has been my trusted friend, typist and editor for all these years. In the last year or two she has actually graduated to a title of personal assistant. I am most thankful for Tasha, my former co-worker at my fast-food job, and her mother for providing me with a wonderful kitty cat. Princess Josie has become most affectionate and loving. We are really getting to know each other’s habits, and believe me she knows that when I wake up, it is time for her breakfast. She’ll make a mad dash for the kitchen. So again, thank you Tasha and mom. If anyone would like to, please leave in the comments below or on Facebook what you are thankful for. I would love to compare notes. As always, I wish everyone a safe holiday if traveling, give your family members plenty of hugs, and as always, happy reading. Greetings, readers. Yesterday morning I purchased the game X-Plane 11, the newest Flight Simulator. If I had a more powerful laptop or a top of the line desktop, I could max out the graphics and make it look awesome. Right now I have a choice. Have it look awesome and run slow as molasses, or make it look average and have it actually perform correctly. The sim I was playing before was Flight Simulator X, from Microsoft. What follows is going to be my comparison between these two major flight simulator games. Let’s start with Flight Simulator X, which I’ve used for years. I must say at this point I prefer it better, for you can actually choose a flight plan in the game and load it. Also, I’m quite used to this game and have accumulated many mods (aircraft, scenery, etc. ), and have gotten the settings just so. I can fly almost any aircraft with relative ease. Take-offs are a cinch. Landings … well, that is a different story. I’ve made a few, but if they had been real flights, the maintenance crew would have had a lot to clean up. Lol. Flight Simulator X, or FSX as it is known, to me is easier to use, and it is easier to designate commands and functions on the keyboard. Also, I know exactly how each aircraft’s switches and knobs are used and what they are for. In the other simulator I am still learning. I give Flight Simulator X a solid score of 9 out of 10. Now for X-Plane 11 and I am going to be brutally honest folks so here we go. The graphics are stunning, even when set to medium. But in the $60 base game, there aren’t that many aircraft to choose from. When downloading after the purchase, the computer prompted me with this question, how many countries and continents would you like to load? The more I clicked the longer the download was going to take. I decided to run a test and choose all. The download was going to take 12 hours. OMG! I canceled that download and simply went with Canada, the United States, Mexico, and South America. That in itself took 3 hours. So far so good. Now for ease of play. As Norman Thayer would say in the movie On Golden Pond, “Good Gawd!” To load a flight plan takes a PhD. Thirteen-year-old YouTubers make it look so easy, yet this 53-year-old dude can’t figure it out. To be honest, I prefer loading the flight plan in the plane’s computer page that pop’s up, for in real-life pilots load their flight plans that way. It gives it that extra realism and I will learn it so help me, I am determined. I actually got a plane off the ground yesterday starting from a runway. I was so happy with myself. And noticed that even with medium graphic settings, the sun shone off the airplane’s dashboard and moved across the control panel with the turning of the plane. That I thought was extremely cool. It also has a feature to have an artificial intelligence, or A.I., pilot that can fly the plane for you. I think you actually need a flight plan for this to work. I tried it without a flight plan and the plane took off from State College’s airport and nose-dived into the downtown streets. Oops. The graphics were wonderful as the alarm bells were sounding: Too low terrain, too low terrain. Crash. Obviously, I’m still learning how the A.I. pilot feature. It’s got to be more simple than that. How I think it works, folks, is that you choose an airport and a gate with engines off, file your flight plan in the computer properly, key word properly, and when all the ground vehicles have left, click A.I. Flies Plane for Me. Click it any earlier than that, and who the hell knows what is going to happen. My preliminary score for this game, and yes, I will update this score in a later blog entry, is a very respectable 6 1/2. I’m going to talk via Facebook page to a couple of YouTubers I know to see if they can help me. Here’s a little something about me. Once I get determined to do something I won’t quit until I do it. I will get this game to run and I will play it. Finally, prayers go out to all the victims and families in the California fire zones and also continued prayers to families who lost loved ones in the recent shootings. I’m praying that one day soon that the insanity will stop. Well, there you go. That is today’s blog entry. Hope you enjoyed it. Here is what is happening the next two Thursdays. Moderate snow is expected in our area, so I am giving Rebecca a work from home day tomorrow. Next Thursday is Thanksgiving, an obvious day off. So one of us will have a blog entry up tomorrow, we will work together next Wednesday as usual, and then have a Thanksgiving blog post up on the holiday. Until then, have a great weekend, love one another and give hugs, take care, and happy reading. Greetings, Joe’s readers. I hope you are all having a good holiday. In the United States we are celebrating Thanksgiving Day with food, family, football, and, for some of us, a nap. For those of you not celebrating Thanksgiving, I hope you are also having a day of good food, family gatherings, and maybe a nap. May all of us feel blessed. Joe will be back with new entries next week. Until then, take care, have a great weekend, and happy reading. Darren and I are going to have his mother over for Thanksgiving dinner tomorrow, and we have a few things to do to get ready. The main thing today is to deep clean the apartment, something we do about every two months. We know we should do it more often, but we just don’t. We keep things clean in general all the time – we do the dishes every day, put things back where they belong so that clutter doesn’t accumulate, and take the trash and recycling out at least once a week. Today, though, we will be cleaning the kitchen, bathroom, and running the vacuum. It takes us about 45 minutes to get through it, and having his mother over tomorrow is a good push to do our deep clean. Joe got on a bus this morning, traveling to visit his buddy-brother David and the family for a long holiday weekend. He has been so excited about seeing family members he only sees a few times a year. Many of them he last saw in August at Bear Spring Camps, but a few of them weren’t there this year, I think. Anyway, I expect he will have a lot of fun and fellowship. Darren will cook the dinner tomorrow, while I get his mom. We don’t cook a whole turkey, but instead he will bake sliced turkey breast under gravy, and make some mashed potatoes and carrots to go with it. It will be a small family gathering but a good one. I am one of the lucky people in this world to get along with a mother-in-law. I love Mom a lot and she loves me back. I am grateful for so much in my life; my family, my friends, my books and shows and other entertainments, as much health as I do have, my physical comforts, having a car (Joe’s life would be easier at times owning a car, so I see first-hand what a blessing it is), and my dear husband. I appreciate Thanksgiving day for the yearly reminder to count our blessing and say thanks. It is so easy to focus on what we don’t have, what we wish we had, and how we wish life was different. It is a good thing to be in gratitude. That is it for today. Tomorrow I will post a quick greeting, then next week Joe will be back, probably with a top ten list. Take care, have a great day, and happy reading. Greetings, readers. The bus tickets have been purchased and I am going to be on my way. Dave and family invited me to New Jersey for Thanksgiving weekend and I gleefully accepted. After checking out Zipcar and Hertz I figured out that Megabus was the way to go. For a modest price, I will be able to enjoy a five-day mini-vacation. I am able to go because of generous friends who offered to take my work shifts on the Friday and Saturday after Thanksgiving. Two people offered and I hope my manager doesn’t schedule them both because one will be angry at me. If either one of you is a regular reader, you have just saved my weekend and I owe you a favor. I’m going to have to look at the Megabus website again to see if I can bring a suitcase and a carry-on. If it is one or the other, the computer will be staying home. In the late evenings at David’s, after our brotherly chats are over, I like to go upstairs to my guest room, crawl under the blankets, and check my email or listen to music. The one thing I am worried about is that my body is programmed to wake up at 4:00am; that will not be happening at David’s house. I will be sleeping in. I can’t wait to get there and enjoy the family’s hospitality. The Thanksgiving meal itself will be in the dining hall at Geri’s church and it is big enough for the entire family. I will probably ask David if I can say Grace or make a speech, as I always tend to do. I’m looking forward not only to the feast but also to be with family once again. I shall treasure every moment. What are the things I am thankful for this year? With my life looking up at the moment, here is my brief list: I am thankful for my kitty-cat Keekee, who is in good health, besides perhaps a slight eye issue; she’s doing great for being almost 13 years old. I am thankful for my family and friends and the possibility to travel and see them. I’m also grateful and thankful that my job has worked out and that most managers think I am doing an excellent job … and making a little extra scratch doesn’t hurt either. Lol. Last but not least, I am thankful for Rebecca and Darren for their years of not only friendship but of hard work to help me put these various writing projects together. As I told my friend this morning, I don’t care if Darren’s book doesn’t put me on the map, I’m hoping it will put him on the map. Kimberly was a cute play. Was it polished? Not by any means. Darren took a good solid skeleton with some meat on the bones and turned it into a literary breathing human being. I wish to say Happy Thanksgiving to all my friends and readers. Your support over the last year has meant so much to me and has kept us going. The recent upswing in view numbers is continuing and we like it. I said yesterday that this entry would be a top ten list, but other work earlier this morning took time away from our working hours here at the office, so the promised top ten list will come as soon as I come back from vacation. My mistake. Next week Rebecca will post two blog entries, most likely re-posts of her choosing, as I will be on the bus and in New Jersey, cramming myself with turkey and trimmings. So until next time, have a wonderful holiday, take care, and happy reading. Greetings, readers. It is the day before Thanksgiving 2016 and I am in a happy mood. My anger earlier this week from my Zipcar debacle has faded and thoughts have turned to the holiday season. As I’ve mentioned before this is my favorite time of year. I love to watch my Thanksgiving Day parade, enjoy a scrumptious turkey dinner with all the trimmings, take a nap and then begin to decorate the apartment. Decorating will be a slow process this year because I have to find where some decorations were stored. My manger set’s box came apart last year and I have forgotten where I put the manger pieces. I’m sure I will find them. I know exactly where my lights are; they are in a big bag in the walk-in closet. Unfortunately, I think all four strands are together in a tangled mess. If I cannot untangle it, or if too many bulbs are broken, I might just go to CVS and buy new ones. Other small trinkets, such as stockings, wooden houses, and glowing snow globes are easy to find and put up. Yummy holiday delights such as candy canes and eggnog are in stores for the offing. I’m not too big a fan of candy canes, but I love eggnog. I have to watch how much I drink because it is very rich, not to mention fattening. Hell, it’s once a year, I don’t care. When I was much younger, my family would cook a turkey and the house would smell wonderful. As all of you know, I don’t cook, so Traci and I are going to go with her family friends to the Nittany Lion Inn for their buffet dinner. That means no leftovers, but I can deal with that. If there are any football games left to watch when I get home, I will sit down and do so. That is also part of my family holiday tradition. The Friday after Thanksgiving is always the day when I begin playing Christmas music. I know some restaurants have already started, but I wait until after Thanksgiving. I don’t want to rush the year away. That’s my holiday tradition in a nutshell. I bid you all a wonderful happy Thanksgiving. We’ll see you next week. Take care, and as always, happy reading. Greetings, readers. The manger set, which was my mom’s, is now up on the credenza. With it is a picture of mom on one side, and a battery operated candle on the other. That small area of my apartment…, done! Today, after morning coffee and Christmas music, I’m going to dig out one or two strands of lights. They’ll go around my framed snow scene painting, which is behind my recliner. I hope all the lights work. I have bad luck with lights sometimes. Located in my hall closet are my three snow globes; two of which light up! By the end of the day, I think this place with be filled with the look of Christmas. I know it’s only December 8th, but I’m late already. Most years my decorations are up the day after Thanksgiving. Well, this is the end of this unexpected, typed and edited on my own, blog entry. Rebecca and I will be back tomorrow with another one. Until then, take care, have a good day and happy reading. Greetings, readers. Here is a follow-up to the blog that posted on Thanksgiving day; successfully, I might add. I will admit I was a little bit worried having Traci meet all 50-plus members of Dave and Geri’s extended family at once. But she fit right in. She decided that she wasn’t going to be nervous, and everyone loved her. It made me so happy to see her talking to people and getting to know them. A week ago today, Wednesday, Traci and I left for New Jersey and enjoyed a gorgeous drive down to our destination, 30 minutes past Philadelphia. I couldn’t believe that for the full three days of the visit it was sunny and warmer. We actually had cool air on in the car. I’m not going to say it is scary, but I found out that my night vision isn’t quite what it used to be. Driving on the roads at night in an area I’m not familiar with, was a wee bit stressful even with the GPS. Once we found Dave and Geri’s house, all was right with the world. Thanksgiving morning was wonderful. I slept in a little bit but came down for morning coffee and quiche before the parade started. We watched most of the Macy’s Thanksgiving Day Parade, but had to leave for the church hall before Santa Claus rolled around. First time I’ve missed him in I can’t tell you how long. The holiday dinner itself was exquisite. I’m not going to call it a delay, but most of the folks wanted to see the Philadelphia Eagles football game before they ate dinner, so serving was put off for three hours. I had asked Geri if I could say Grace, because I also wanted to make a little speech as I do at gatherings from time to time. She happily agreed. Once everyone was seated, and my Grace and speech had been said, we partook of a wonderful soup made by Shannon Merkhofer, followed by turkey, ham and every trimming you could think of. What an amazing meal. Just when you thought it couldn’t get any better, the delectable desserts were placed in the serving area. I had the pumpkin pie because I am a traditionalist. The sun had already gone down when the party began to wind down, and it did take a while to put all the folding chairs away and clean up all the pots and pans. When we arrived back at Dave and Geri’s house, Traci immediately went to bed. Geri decided to take the dogs for a walk, and Dave and I collapsed on the couch with the Green Bay Packers game on in the background. On Friday morning, I was up early to have coffee with my brother and buddy before he left for work. Later on, Traci came downstairs, followed by Geri. We had breakfast and then we packed up, because Traci wanted to go to a hobby store nearby to get a stuffed animal as a souvenir. We had seen The Happy Hippo Toys store while we were parking the car the day before. As we got on the highway to head home, I was happy and proud that everything had gone so well. I was driving in the big city, or at least on the interstate nearby, and Traci was enjoying all the sights. She loved the skyline of Philadelphia, just coming off of the Ben Franklin bridge. We got home about 3:30 Friday afternoon, and I will admit to you I was exhausted. It’s always strange but true, no matter how much you look forward to going somewhere and how much fun you’ve had, it is a nice feeling to come home to familiar surroundings. I was happy to see my kitty cat Keekee and she was happy to see me. If I had to rate this trip, I would give it A+, 10 out of 10. Until Friday, I hope everyone had a great Thanksgiving, do take care, and as always, happy reading. Greetings, readers. Happy Thanksgiving to all of you in the United States. Happy Thursday to all of you in different countries. If all goes well, Traci and I will be sitting with my buddy and brother Dave and his family when this is published. I hope you are enjoying time with your friends and families today, whether you are celebrating Thanksgiving or not. I miss a lot of people in my family, which is why it means so much to me to be sharing the day with Dave and my extended family, and my girlfriend. If you can’t be with your family today, I hope you are spending time with people you care about. This might be the only post this week. If so, I will be back next week with the usual two entries. Until next time, have a great week, take care, and happy reading.